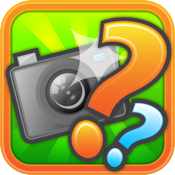 Photos With Pals is the new addictive and fun photo guessing game for mobile phone photo fans. If you love Instagram, snapping the world around you or uploading photos to Facebook, Photos With Pals is the game for you! Can your friends guess the picture hidden behind the tiles? Take a picture with your phone, create a fiendish puzzle and challenge your friends to guess what it is. The more tiles they remove, the more coins you win! Share your imaginative images with friends and compete to see who can guess the quickest. Unleash your creative spirit and snap everyday objects from strange and amusing angles. No two games will never be the same! * EASY TO PLAY: Snap it, share it, guess it! * NO SKILLS REQUIRED: Just photograph what you see or import an image from your gallery. * BEST WITH FRIENDS: Invite your friends to join in the fun via Facebook or email. * ENDLESS GAMEPLAY: The only limitation is your imagination! * PHOTOBOMB: Too many letters to choose from? Photobomb them away! * FLASH: Use the flash to get a sneaky peek of the image as a negative. * RANDOM PLAY: Go global and play with people from around the World. * SHOP: Running low on in-game coins? Top them up from the shop.